Because C. Dorflinger & Sons used only paper labels on its produces, their identification relies to a large extent on the company’s catalogs such as DORFLINGER LINE DRAWINGS which was used here. The identification of both pattern and shape (blank) is especially helpful — and, in fact, is sometimes necessary — when authenticating cut glass produced by Dorflinger. Probably no other manufacturer has been so greatly misrepresented in the marketplace. This misrepresentation is sometimes inadvertent, sometimes willful (see Fake Dorflinger). 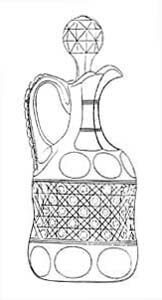 Handled decanter cut in pattern no. 99 on shape no. 886h: H = 10.75″ (27.3 cm), max D = 4.75″ (12.1 cm), wt = 3.75 lb (1.7 kg). Original stopper. Sold for $675 in 1988. Because the Dorflinger company used only impermanent paper labels on its glassware, the company’s products have always been among those that are frequently incorrectly identified. This situation continues today, as any viewer of www.ebay.com will observe. However, a large amount of reliable material about this White Mills, PA glassworks is now available. Publications, including factory catalogs, are listed below. Their use can greatly help in resolving problems of identification. 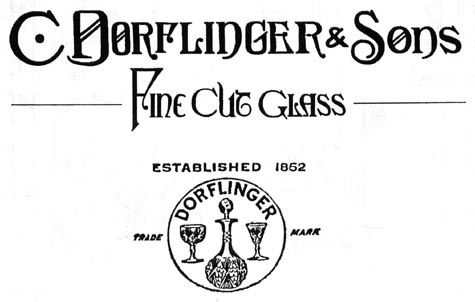 Chances are great that a piece of Dorflinger cut glass — that is purchased today — will have been made after 1881, when the firm, C. Dorflinger & Company (also called the Dorflinger Glass Company), became C. Dorflinger & Sons. In 1904 the company was incorporated in the states of Pennsylvania and New York and was thereafter officially known as C. Dorflinger & Sons, Inc. 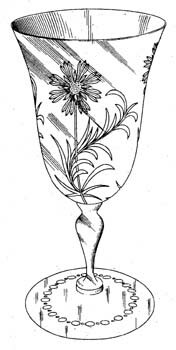 The year 1904 also marks, approximately, the beginning of “late period” Dorflinger glass where the cut-glass designs commonly feature daisy-type flowers and a minimum of miter cutting. Today these designs are much less appreciated than the earlier “brilliant style” and are not particularly popular with collectors. This folder focuses on the c1885-c1905 years, a period that is sometimes referred to as “middle period” Dorflinger. This time period has also, with some justification, been referred to as the “golden age” of the cut-glass industry in this country. “Early period” Dorflinger — cut glass made before c1885 — is believed to be essentially identical to products made by other glassworks that produced luxury glass. To have been made in a Dorflinger factory, an item from this period must have documented provenance. After c1885 individual factories began patenting their designs and producing illustrated catalogs. With this development, identification becomes less uncertain. Prior to 1881, Christian Dorflinger (1828-1915) operated glassworks in Brooklyn, NY as well as in White Mills. The latter factory, called the Wayne County Glass Works, was established in 1865 and began cutting glass two years later when it hired the master cutter and designer John Sarsfield O’Connor (1831-1916). The Brooklyn factories — eventually there were three of them — produced utilitarian, as well as luxury, glassware. Luxury glass was an especially important product of the third Brooklyn factory, the Greenpoint Flint Glass Works, which was founded in 1860. During the following year it, famously, made a table service for the Lincoln White House. At the country’s centennial celebration — the 1876 International Exposition held in Philadelphia — the Dorflinger Glass Company received a “certificate of award” for the excellence of its wares. 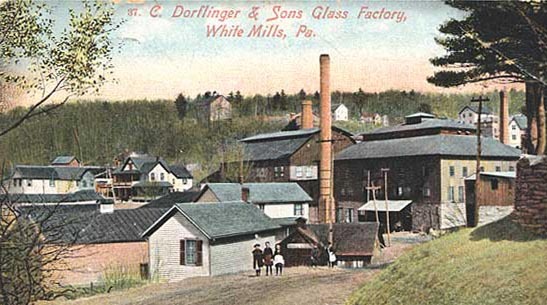 The Dorflinger exhibit probably included glass made in Brooklyn as well as White Mills. Eventually the Brooklyn factories were either leased or sold. 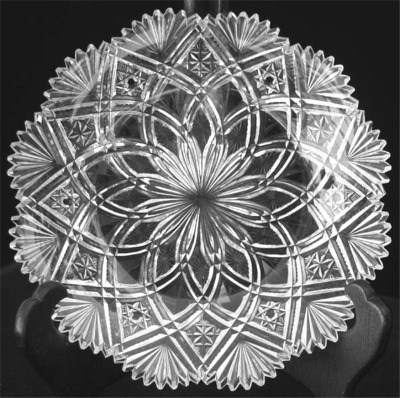 In the twentieth century art glass produced in White Mills included the Kalana series of acid-etched designs, reproductions of Venetian glass, and — in near-by Honesdale, PA — acid-etched and gilded glassware. After several years of financial stress C. Dorflinger & Sons, Inc. went out of business in 1921. Principal sources: Feller (1988); The following article is an over-view of Feller’s book: C. Dorflinger & Sons: An American Tradition in Fine Crystal, Glass Collector’s Digest, Vol. 1, No. 2, pp. 10-13, 16-25 (Aug/Sep 1987); Barbe and Reed (2003). Prior to 1988, the most complete account of the Dorflinger company was contained in three articles written by Katheryn Hait Dorflinger Manchee, the former wife of a grandson of Christian Dorflinger. They were published in 1972 in The Magazine Antiques and later reprinted in DiBartolomeo (1974). These articles, which are well-illustrated, are still worth reading today. 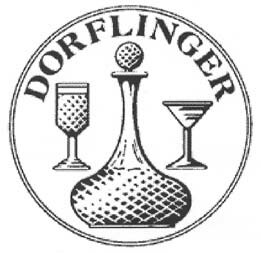 The Dorflinger trademarks were printed on gummed paper labels and affixed to items sent from the factory in White Mills, probably beginning in 1888 (Spillman 1996, p. 141). Although uncommon, it is not rare to find original labels today. Collectors should be on the lookout for fraudulent labels, however, because reproductions are easily made. 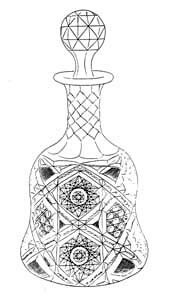 The label’s basic design — a decanter with two flanking drinking glasses — remained the same over the years, but the shapes of these items were changed from time-to-time. Also altered were the cut-glass patterns on these items. Although not always easily identified, the Strawberry Diamond and Fan and Belmont patterns have been reported (Feller 1988, p. 105), while what appears to be the Royal pattern is shown in the Dorflinger advertisement on the Dorflinger Table of Contents page. Here are two examples of Dorflinger trademarks. The mark on the left has been replicated on a refrigerator magnet, available from the Dorflinger Glass Museum. 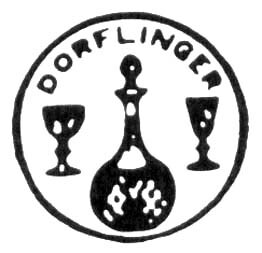 The Dorflinger trademark was never acid-etched on the company’s glassware. Additional material is available at the Dorflinger Glass Museum and the Corning Museum of Glass. “Dorflinger: A Selective Guide” can be requested from the latter. [Compilation Catalog, c1890-c1920]: DORFLINGER LINE DRAWINGS. Published by the American Cut Glass Association in co-operation with the Dorflinger Glass Museum and the Dorflinger – Suydam Press. 1994, viii + 155 pp. [Compilation Catalog, c1893-c1915]: C. DORFLINGER & SONS, FINE CUT GLASS. With some original prices, published by the American Cut Glass Association in co-operation with the Dorflinger Glass Museum and the Rakow Library of the Corning Museum of Glass. 1997, xlii + 150 pp. The first section of this catalog has been re-dated from c1886 to c1893 because it contains the following “new” patterns introduced during the years indicated, according to contemporary information published in The Jeweler’s Circular: Sultana (1890), Florentine (1891, although patented in 1888), Belmont (1891), Dresden (1891), Princess (1893), and American (1893). The second section of this catalog has been re-dated from c1895 to c1893 because the catalog lacks the address of the retail showroom that was opened at 915 Broadway, NYC in 1895, and because this section lacks the following patterns that were introduced between 1893 and 1895: Princess (1893), Savoy (late 1893 or early 1894), and Lorraine (1894, also patented in 1894). Incidentally, this section also lacks the Colonial pattern, patented in 1893. But it includes –and makes considerable use of — the American pattern (1893). The Avondale, Princess, and Savoy patterns are written-in on p. 109 (p. 27 of the original catalog). The revised date for this section is based on printed material only. c1890-c1920: Line Drawings, Appendix III in Feller, J. Q., 1988: DORFLINGER, pp. 229-270.
c1905-c1920: Wetton Portfolio Catalog, with original prices, Appendix IV in Feller, J. Q., 1988: DORFLINGER, pp. 271-361.
c1907-c1910: C. DORFLINGER & SONS. Everybody’s Press, Hanover, PA. 1970, 45 pp. Reprinted in 1981 by The Christian Dorflinger Glass Study Group, Silver Spring, MD. In a little country store beside U. S. 6 at White Mills, Pa., is a private collection of glassware which has few equals. It belongs to John C. Dorflinger, whose cousin Christian Dorflinger almost a century ago established a glass works that for seven decades furnished tableware to Presidents, royalty and the blue bloods of two continents. Eight Presidents from Lincoln to Theodore Roosevelt bought crystal from these mills, and in Mr. Dorflinger’s shop you can see the working samples of these sets. Dorflinger’s fame is international. His fluted glassware graced the royal train of the present Duke of Windsor. A set of crystal numbering 2,300 pieces was made for President Menocal of Cuba at a cost of $60,000. Mr. Dorflinger will show you all his choicest pieces, relate the history of each, [and] point out interesting features of its design. He will also explain manufacturing processes and show you the ingredients, tools and molds used. In a small workship near-by, you may have an opportunity to see a few of the old-time artisans. With almost magical touch, they cut designs into “blanks” of goblets, pitchers & bowls. If time permits, they will explain the operations required to cut the designs — the roughing, smoothing, and polishing. Many are of such infinite fineness that a magnifying glass is needed to distinguish the detail. The copper wheel used for this type of work is so small that it appears to be nothing more than a slight burr at the end of a rod. Although the great white mills which gave the village its name are no longer operating, Mr. Dorflinger has an almost inexhaustible supply of uncut hand-blown crystal blanks in various shapes. On these he continues to engrave the old designs which have been handed down in his family or creates new ones. This file is largely based on the J. Stanley Brothers, Jr. volumes of patent material at the Rakow Library of the Corning Museum of Glass and the U. S. Patent and Trademark Office’s Web site. Also helpful have been the composite Dorflinger catalog published in 1997 by the American Cut Glass Association in co-operation with the Rakow Library and the Dorflinger Museum, and the early work of Revi (1965, pp. 266-281, 319-323). All patents were assigned by their patentees to the company, except those marked with an asterisk (*). These patents were retained by the patentees. The last four patents, above, are neither listed nor shown in Revi (1965). Here they are, beginning with no. 40,497 on the top left and ending with no. 40,876 on the bottom right. Probably neither of these two patterns was produced commercially, so each is “unnamed” here. A factory sample of the former pattern is shown in Feller (1988, p. 228). It is assumed that all four patents were primarily intended for stone-wheel engravings, although Charles O. Northwood, their designer, seems to have been employed by Dorflinger mainly for assistance with the company’s acid-etched Kalana and Florida “lines” (Feller 1988, p. 89-90).